As with the areas of Umbria and Emilia-Romagna in the north, I’ve grouped these two regions for no other reason than convenience (on my menu bar). But let me be clear, the wines coming from these areas really can’t be any more different, apart from being stellar food wines, that is. Puglia is a must-visit. Well, except maybe in September, when it can be quite warm. OK, when it can be really hot. And one of the added benefits of visiting Puglia is that the wines of Basilicata are somewhat close by, roughly 90 minutes to the west (of Bari). The Vulture area of Basilicata, sandwiched mid-way between Bari (Puglia) and Avellino (Campania), can make for some really adventurous touring. The added benefit of tasting the wines and foods from the area, well, that pretty much seals the deal. Yes, it’s time to visit, even if (or maybe because!) it’s off pretty much everyone’s radar. Puglia (or the ancient, Apulia) is a pretty big area – at least from end to end – from side to side, not so much (i.e. it’s pretty narrow). You may already be familiar with the wines from Salice Salentino area (Negroamaro), or with the Primitivo variety (that some like to call Zinfandel, it’s not), but there are also many different areas within the area itself – Primitivo del Salento, Primitivo di Manduria, Castel del Monte, etc. ; some are even growing Fiano. But enough about the wines of this region, good as they can be, it’s the historical treasures and timeless beauty of centuries old buildings braced up against the majesty of the Mediterranean that really gets me going (read: jazzes my wife). 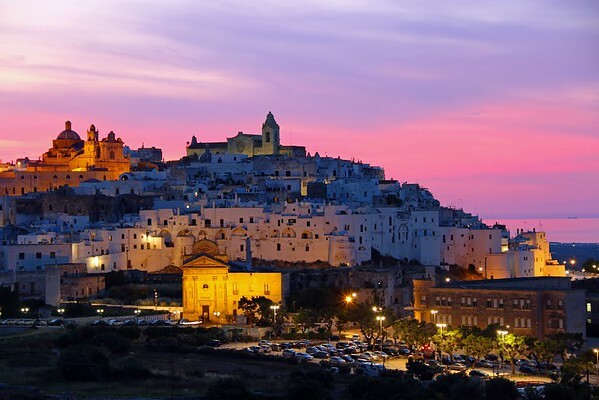 Don’t believe me, Google some images of Ostuni , (this one taken by Deigo De Gaspari, also, above) the ‘White City’. There are hundreds and thousands more images of this region for a reason; this place is beautiful!